Allison Streett has received local and national recognition in various group exhibitions and competitions. Among her awards and honors are an honorable mention at the 2016 Art Hop, a grant from the Sumasil Foundation in 2006, an award from the 2006 TSA Membership Show, judged by Patricia Meadows, and a grant from the Hillsdale College Christian Visual Arts Educational Fund in 2003. 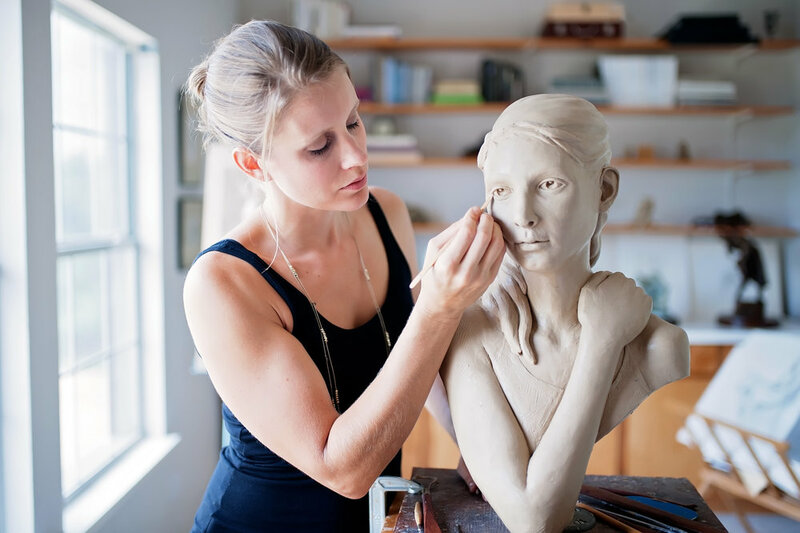 She was one of ten sculptors selected to participate in the 24th Annual National Sculpture Society Figure Modeling Competition, and placed first in sculpture in the 2002 Michigan Small College Art Competition. Allison lives outside of Fort Worth, Texas with her husband and their six children. I work in the tradition of the Masters of figurative sculpture. Through the common language of the human face and figure, we instinctively recognize and respond to one another’s physical and emotional conditions. I desire to use this natural affinity, whether through narrative or allegory, capturing what is remarkable in the common and provoking insights into ourselves and those around us. My work has taken different directions over the years. My Christian faith has always influenced my work, and several pieces are drawn directly from biblical stories. In some pieces beauty is my primary language, but often there is an element of brokenness, distortion, or ugliness, which reflects the grief, pain, and separation we all experience. Motherhood also profoundly impacts both the subject matter I choose and the execution of my ideas. Several of my sculptures represent mothers and their children from around the world who are affected by war and disease; others deal with the internal devastation of losing a child.